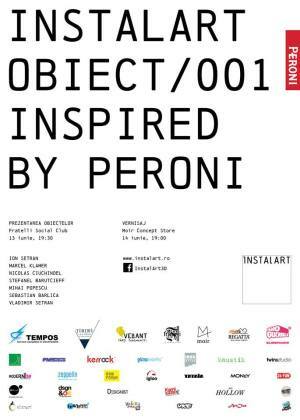 Instalart/ Obiect/ 001- Inspired by Peroni shows (on 13 and 14.06) give you the opportunity to meet the designers and their design projects, turned into objects by Instalart with the help of its sponsors and partners. The inspiration theme of the projects is Italy from the 60s. "INSTALART/OBIECT/001 - presenting the objects" Art Show in Bucharest. You can get here description, reviews, address, time and details of "INSTALART/OBIECT/001 - presenting the objects" Art Show in Bucharest. Visit Bucharest Tips for more Art Show events in Bucharest!